"But, Mom, that's not very long!" Not only does my son wear his heart on his sleeve, he currently has a heart on his face as his summer tan is fading. "Mom, I don't want you to die." "I don't want to die, either. However, we both know that the breast cancer can't be cured. I hope I live a lot longer, but we just don't know. Right now, I'm hoping to live long enough to see you graduate from high school in 2020 and see you get started into college." "But, Mom! That's not very long!" The horror in his eyes was just that ... horrifying. He doesn't think about cancer much and because I live a highly functional life, it's really not at the forefront of his daily life. When confronted with the reality of the disease, though, it rattles him down to the soul of his being. "I know, Michael, I know. We really don't have any control over it, though. All I can do is continue to pray and to continue to follow the treatment recommendations. You know I do a lot of reading and I keep up with everything that is happening in cancer land." Michael was fixated on the time frame I gave him. "But, Mom! That's not very long! I mean, I'm graduating from high school tomorrow! You need to live longer than that!" I kept my voice quiet and calm and agreed with him. I told him that this was merely a preliminary goal ... and that once that goal was met, I'd set new goals. I didn't expect this conversation that morning when we got into the car to go to school. The bulk of it happened while we were parked beside the gate near the track and field. Michael got out of the car with a tear in his eye. He looked me straight on and said, "That's not very long." I watched him as he walked towards his classroom, hands shoved into his pockets, most likely muttering to himself, "That's not very long." While man sized at nearly 5'11" tall, he is still maturing and at that moment, he was quite my little boy who used to grab my pinky finger and say, "Mommy, help me!" I placed my head against the steering wheel and I cried. I attended a breast cancer conference yesterday. I didn't really have any expectations, but at the end of the day, I realized that I expected more and was vastly disappointed. I expected more than a medical doctor touting the "wonders of homeopathy (diluted water)," especially after saying that her entire presentation was based on evidence-based research. No mention of the fact that homeopathy has been debunked many, many times, with even more clinical trials proving homeopathy is a fraud coming out just last week. I expected more than a resource fair that had a booth sponsored by a group that includes "Cancer Prevention" in their name. The woman at that table was not even aware that breast cancer can spread through the blood stream and not just through the lymph system. I expected more than the speaker for "Updates in Metastatic Breast Cancer Treatments" to talk about the history of treatments and to not have a single new piece of information. I expected more than her to dismiss metastatic disease to the same category as diabetes and call it a chronic disease with "years of expected survival," only for her to admit that her definition of "years" is anything over three years. I expected more than a swag bag with "Pinktober" on it. I expected more than a "nice" day. I felt like I was at a sorority sister reunion with absolutely no sense of urgency at all involved in solving the problem of breast cancer. No one was aware of the reports coming out of Lisbon from the conference held there the first week of November. Hearts were in the right places. Lots of hard work went into this day and as I said, it was "nice." When I go back to look at the description of the event, though, it uses the words, "cutting edge" to attract people and there was nothing "cutting edge" about it. I take that back ... there was one cutting edge speaker and that was Dr. Elly Cohen from the University of San Francisco and her presentation on Understanding Clinical Trials. She promoted a new website, Breast Cancer Trials, a very helpful tool in looking for trials. There is a section for metastatic patients in that as well. I wore one of my "Pinktober" shirts ("No cancer here, but ... " on the front and "What about the rest of me?" on the back.). 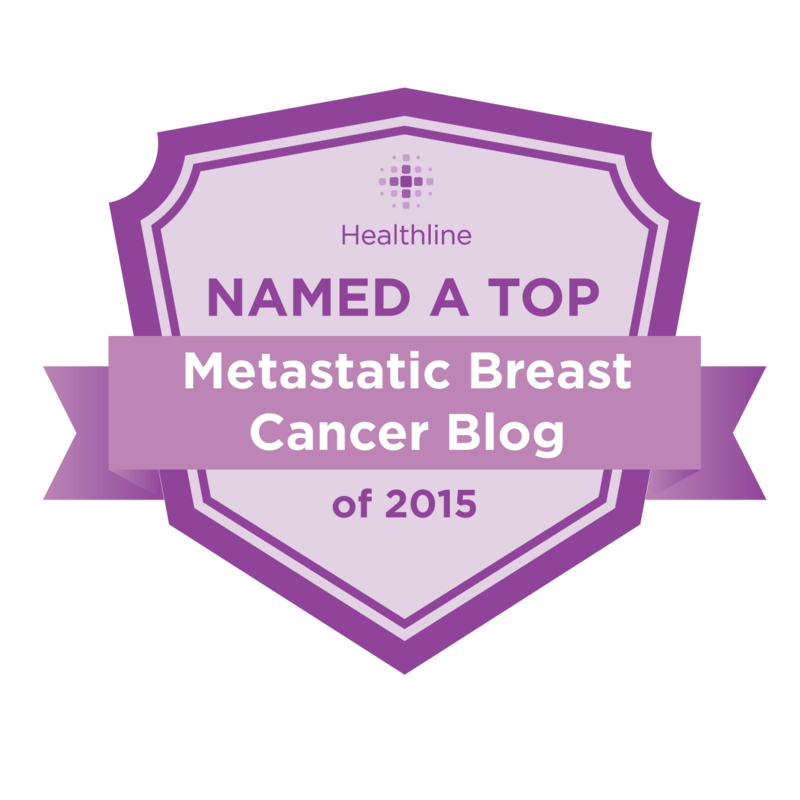 I spoke up every chance I could to bring more attention to the world of metastatic breast cancer. I had several strangers thank me for my questions. I handed out my card all over the place. I had too many tell me that I was an "inspiration" and that I was "so strong" to do what I was doing. One person asked me to consider having a display table at next year's conference. I woke up this morning to the news of another death. While I was out having a "nice" day, another 110 in the United States died of this "nice" disease. I don't want to be strong, nor do I want to be an inspiration. I want people to be urgently aware of the reality of breast cancer and I want people to DO SOMETHING! I want people to learn more about the reality of this disease rather than basking in the pink glow of misconception. I want so much more than a pink ribbon. I refuse to be silent in order for others to stay comfortable. As Plato once said, "Your silence is your consent." Until metastatic breast cancer is at the very forefront of the breast cancer conversation, we are giving consent to the pink clouds of affirmation. If we're not aware of metastatic breast cancer, we're not aware of breast cancer at all. News Alert! Pink Ribbons Matter! I think Nancy Brinker wants my shirt. However, I think she wants it for different reasons! The NYTimes ran a piece by Gina Kolata on October 30 entitled "A Growing Disenchantment with the Pinkification of October." The title is self-explanatory and covers the many ways in which those who have had breast cancer in the past or who currently have breast cancer feel very removed from the modern pink ribbon movement. Today, the NY Times ran Nancy Brinker's response which fired the opening statement, "I am seeing red ...."
Welcome to the club, Nancy! I'm seeing red, too, but for far different reasons than yours. Brinker's response to the NYTimes went on to say that the Pink Ribbon has come to symbolize breast cancer and she gave a brief history of the Pink Ribbon. Every time she refers to that ribbon and its color, she capitalizes it ... Pink Ribbon. She notes that the Susan G Komen Foundation took their cue for the Pink Ribbon from the Red Ribbon used in the AIDS movement. She talks of her promise to her sister to find a cure for breast cancer and her promise to "bring awareness of the need for screening, testing, treatment, research and cures, and raise billions of dollars to fund breast cancer research." She talks about races, relays and volunteers, but she leaves a few things out. She doesn't talk about the average amount spent by the Komen Foundation for research averages less than 20% of their annual revenues. She doesn't talk about the unholy alliance between corporate sponsors and the placement of pink ribbons on products in order to increase sales. She ignores that there is no regulation of the Pink Ribbon and that anyone can slap a Pink Ribbon on any product to dupe the customer into believing they are doing something about breast cancer. She ignores the mammoth mountain that the Pink Ribbon has become and the shopping mecca the Pink Ribbon has created. She ignores the fact that billions of dollars have been made off the backs of the dying, all in the ever-to-be-honored name of "The Pink Ribbon." She then closes her tirade with a cue from yet another movement: "Pink Ribbons matter!" Blink. Did she really say that? REALLY? SERIOUSLY? How does this Pink Ribbon matter? Maybe these Pink Ribbons are the ones that matter! In spite of the claim made on this bottle, there were no records of any donation being made to any organization resulting from the sale of this Pink Ribbon product. But ... Pink Ribbons matter! This is the one! This is the one that REALLY matters! After all, this Pink Ribbon saves the world! As a woman who is living with terminal breast cancer, I will continue to shout: PINK RIBBONS DON'T MATTER AT ALL!!!!! My life matters! The lives of the hundreds of thousands of people diagnosed with this disease each year matter! It's NOT about the ribbon! I am the first to admit that the Komen Foundation started out with a fine and noble goal and that many parts of that goal have been met. However, I would love for Nancy Brinker to admit that the damn pink ribbon has grown out of control. (I don't use caps to refer to the ribbon ... I only did so in the photos to illustrate the sarcasm I feel.) However, I am not the same person I was back in 1980 and I would like to think that the Komen Foundation is not the same organization that it was back then. Just yesterday, Komen announced that donations made to Komen could be directed in the area that the donor chose, including the area of metastatic breast cancer research. But then, Nancy Brinker had to go and ruin the goodwill with her nonsensical claims. Awareness is not enough. Races are not enough. Relays are not enough. Partnerships are not enough. Volunteers are not enough. Research, not ribbons. Research matters.